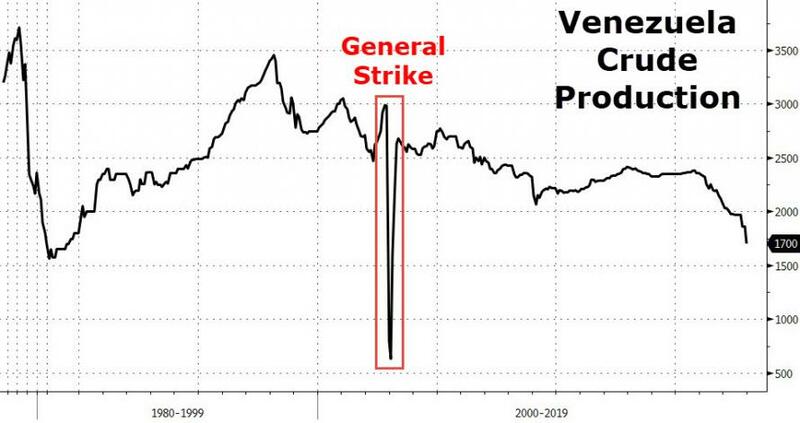 The decline of Venezuela’s oil production for the foreseeable future has been assumed, and to a large extent, already priced into the market. However, an acceleration in the rate of decline is possible, and a few recent developments raise the odds that such a disaster will become a reality. Reuters reported that state-owned PDVSA is completely falling apart, with workers walking off the job at a frightening pace. The conditions for oil workers has deteriorated for years, with shortages of food, unsafe working conditions, and hyperinflation utterly hollowing out the value of paychecks. Since last year, however, things have grown worse. Venezuela President Nicolas Maduro sacked the head of PDVSA and handed over control to the military in order to keep the armed forces on his side. But Major General Manuel Quevedo has only accelerated the decline of PDVSA, which once held a reputation as one of the better managed state-owned oil companies in the world. Moreover, the situation at the company’s refineries are arguably worse. Fires are breaking out because they are falling apart and they no longer even have the staff to run them properly. Even ports are reducing operations because of a lack of workers. But the problems don’t stop there. PDVSA only accounts for about half of the nation’s oil production on its own. The rest comes from joint ventures with international oil companies. Production at the joint ventures has eroded at a much slower pace than operations run solely by PDVSA. Reuters says that Venezuelan intelligence “burst into the Petropiar joint venture’s office” and arrested two workers. The arrests appear to be the first to directly hit an international company operating in the country. “Oil industry companies would do well to be cautious and stop assuming that good relations with PDVSA can last forever due to a common interest in pumping oil,” Raul Gallegos, associate director with the consultancy Control Risks, and author of Crude Nation, a book about how oil ruined the Venezuelan economy, said in an interview with Reuters. It isn’t necessarily that the few remaining international oil companies in Venezuela will immediately withdraw their personnel. But at some point the costs of operating become too high. Companies like Chevron and others have long been frustrated with lack of payment. Reuters reports that they are now also increasingly aggravated by PDVSA’s chief Miguel Quevedo, who refused to enact reforms to stop the decimation of the country’s oil and refining facilities. Ultimately, President Maduro’s grip on the nation will become increasingly shaky. Utterly dependent on oil exports for revenues, the resources available to Maduro are vanishing.